'A wonderfully fresh, vivid and engaging portrait.' Jane Ridley, author of Bertie: A Life of Edward VII'Has much of the abundant charm of its author.' Spectator'The glory of this book is in the details.' 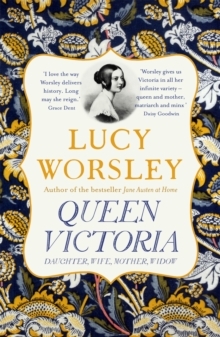 The Times'Worsley's command of the material and elegant writing style make this a must-read.' Publisher's Weekly*******************************Who was Queen Victoria? A little old lady, potato-like in appearance, dressed in everlasting black? She was also a passionate young princess who loved dancing. And there is also a third Victoria, the brilliant queen, one who invented a new role for the monarchy. Victoria found a way of ruling when people were deeply uncomfortable with having a woman on the throne. Her image as a conventional daughter, wife and widow concealed the reality of a talented, instinctive politician. Her actions, if not her words, reveal that she was tearing up the rules on how to be female. But the price of this was deep personal pain. By looking in detail at twenty-four days of her life, through diaries, letters and more, we meet Queen Victoria up-close and personal. Living with her from hour to hour, we can see and celebrate the contradictions that make up British history's most recognisable woman.